Connect to https://inmon.sc16.org/sflow-rt/app/sc16-weather/html/ between now and November 17th to see a real-time heat map of the The International Conference for High Performance Computing, Networking, Storage and Analysis (SC16) network. 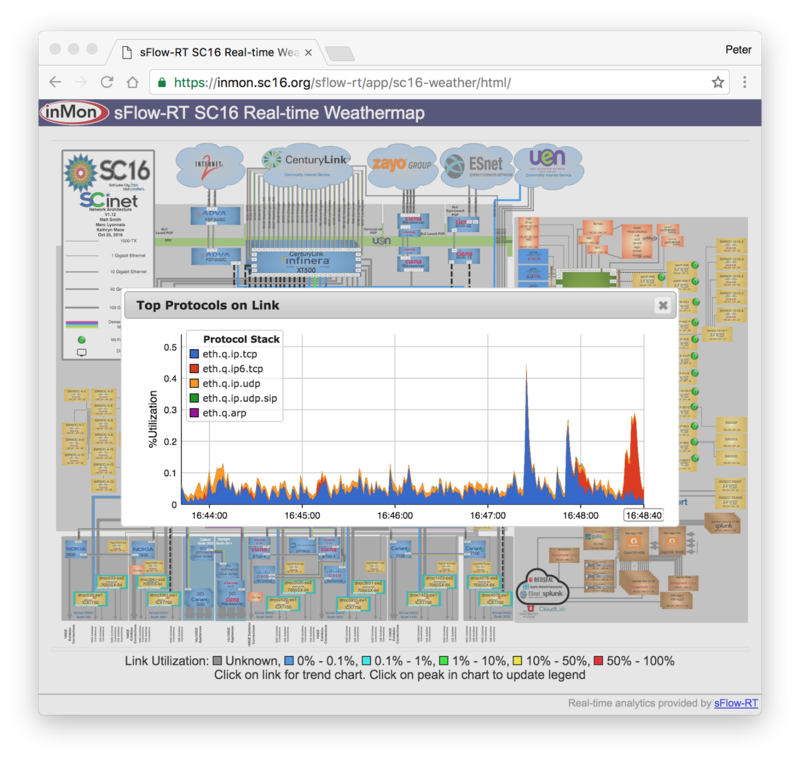 From the SCinet web page, "The Fastest Network Connecting the Fastest Computers: SC16 will host the most powerful and advanced networks in the world – SCinet. Created each year for the conference, SCinet brings to life a very high-capacity network that supports the revolutionary applications and experiments that are a hallmark of the SC conference." 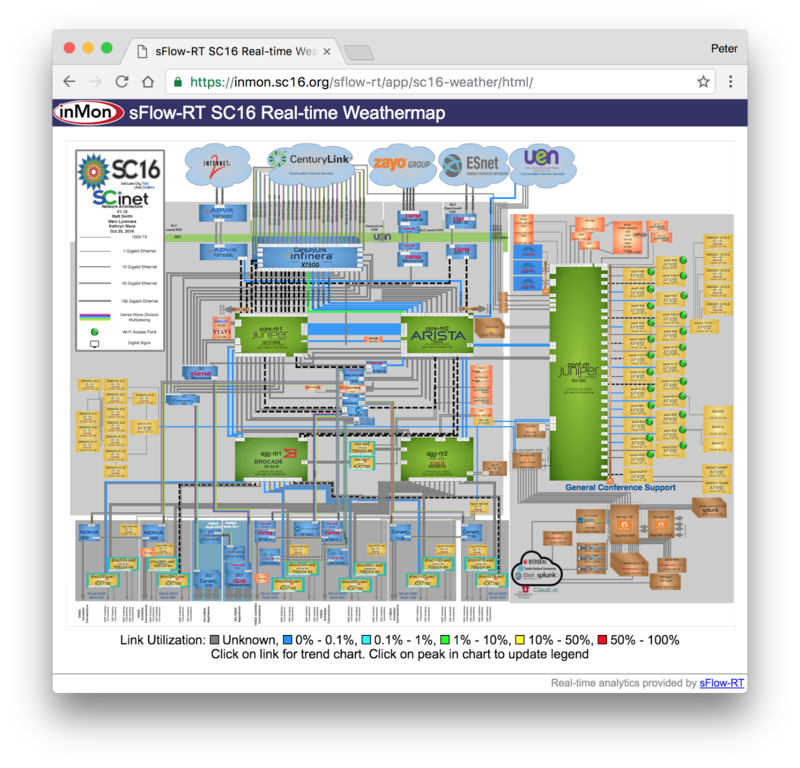 The real-time weathermap leverages industry standard sFlow instrumentation built into network switch and router hardware to provide scaleable monitoring of the SCinet network. Link colors are updated every second to reflect operational status and utilization of each link. Clicking on a link in the map pops up a 1 second resolution strip chart showing the protocol mix carried by the link. 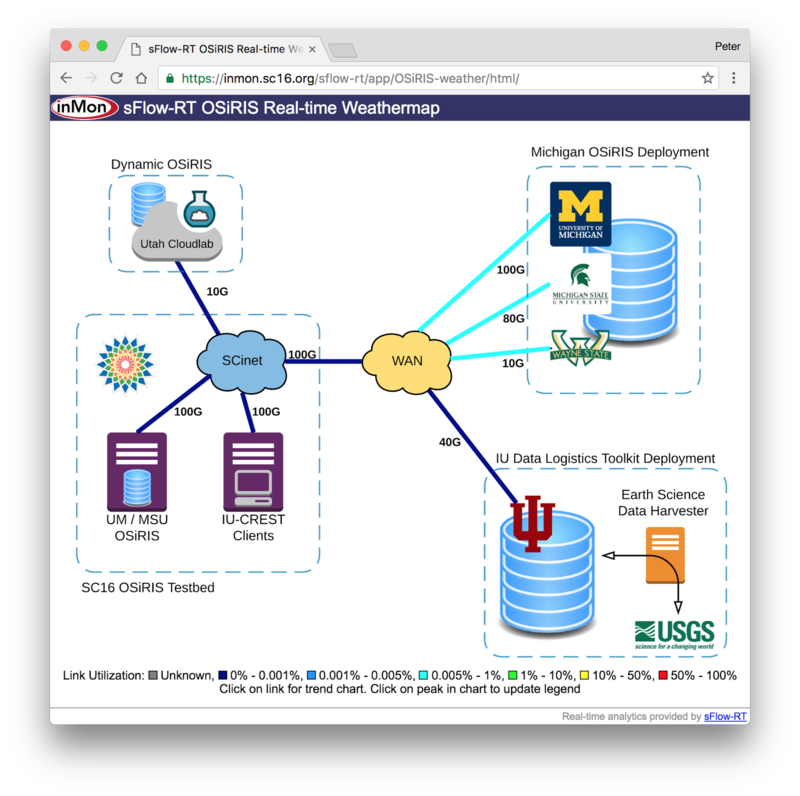 OSiRIS (Open Storage Research Infrastructure) is a "distributed, multi-institutional storage infrastructure that lets researchers write, manage, and share data from their own computing facility locations." Connect to http://inmon.sc16.org/sflow-rt/app/OSiRIS-weather/html/ to see an animated diagram of the SC16 OSiRIS demonstration connecting SCinet with University of Michigan, Michigan State, Wayne State, Indiana University, USGS, and Utah Cloudlab. Click on any of the links in the diagram to see traffic. 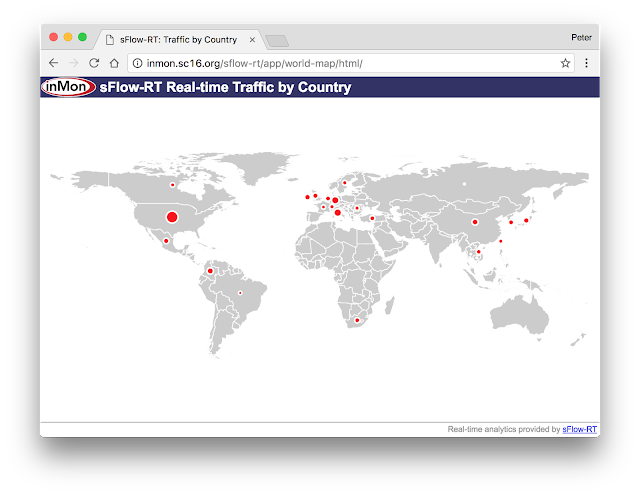 Connect to https://inmon.sc16.org/sflow-rt/app/world-map/html/ to see a real-time view of traffic from SCinet to different countries. The SCinet real-time weathermaps were constructed using open source components (https://github.com/pphaal/sc15-weather, https://github.com/sflow-rt/svg-weather, https://github.com/sflow-rt/dashboard-example, and https://github.com/sflow-rt/world-map) running on a single instance of the sFlow-RT real-time analytics engine. See Writing Applications and download sFlow-RT to see what you can build.